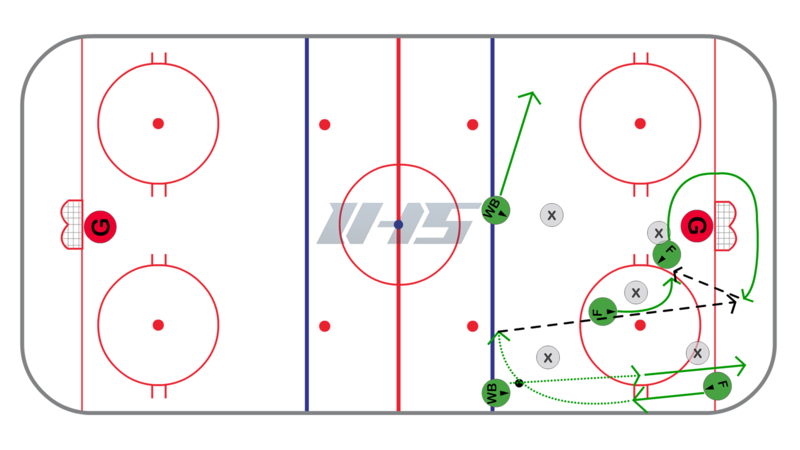 Offensive Zone - Net Front Cycle #1 | Ice Hockey Systems Inc. In this offensive zone option the forwards in front of the net can rotate the net front position. This allows them to stay hidden and create confusion for the defenders. In this variation the forward in the high slot can go to the front of the net and the player in front of the net can cycle out the back side and behind the net. As the switch along the wall happens it should create more confusion for the defenders. When the puck is moved down low then the player in front can pop out and create some separation from the defender, show a good stick, receive a pass, and have a great scoring chance.